Revenue Watch is pleased to announce the publication of Transforming Resource Wealth into Well-Being, an overview of our work since we were established as an independent organization in 2006 through 2009. This milestone document presents highlights of our capacity building, technical assistance, grantmaking, advocacy and research activities, along with concise explanations of our principles and our approach. It also features firsthand accounts from selected grantees, partners and advisors, and vivid photographs from the different regions in which we operate. Revenue Watch has been a leader in the global movement for responsible extractive resource management since its founding in 2002, when the Caspian Revenue Watch program was created by the Open Society Institute to shed light on burgeoning oil wealth in the Caucasus. 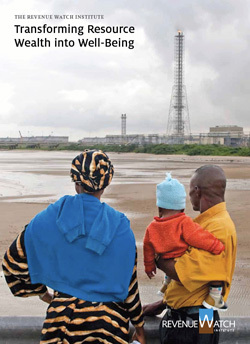 The same year, a group of NGOs led by Global Witness and the Catholic Agency for Overseas Development (CAFOD) launched the Publish What You Pay campaign for disclosure of government payments by oil, gas and mining companies, and British Prime Minister Tony Blair unveiled the Extractive Industries Transparency Initiative (EITI), heralding a new level of cooperation between governments, civil society and extractive companies concerned with improved governance in resource rich countries. The movement has enjoyed considerable success in the intervening years. Over the past decade, governments, citizens and advocates have demonstrated a new understanding of the links between natural resource management and social and economic development. Publish What You Pay is now a global alliance. More than half the world's resource dependent countries have embraced the EITI, garnering support from many extractive companies. International institutions like the World Bank have anchored extractive resource governance in their agendas, and politicians profess their commitment to transparency and accountability. And as an independent organization, Revenue Watch has expanded its agenda to include a wealth of research, capacity building, technical assistance, grantmaking and advocacy goals in dozens of countries worldwide. Nevertheless, many governments still lack the capacity to collect resource rents and enforce contracts. Public disclosure of transactions and payment streams remains limited. Most parliaments do not have the knowledge to play their proper oversight role and media coverage of the sector is poor. In too many countries, spending of resource revenues remains opaque, inept or corrupt. Revenue Watch seeks to analyze and expose the realities of resource management, and to find and institutionalize durable solutions to the poverty, corruption and conflict that, paradoxically, often accompany resource wealth. But Revenue Watch and our partners know that good resource governance cannot depend solely on an active civil society, well-meaning politicians or enlightened companies. Rather, it requires the collaboration and innovations of all three. Our mission begins with the knowledge that abundant natural resources offer no guarantee of prosperity for the countries that possess such wealth. We work from this starting point to promote and provide the tools of good governance, effective oversight and full accountability that help leaders and citizens secure lasting benefit from their most valuable resources. This report offers an overview of our work to date, and the new opportunities and challenges for RWI's work to come.